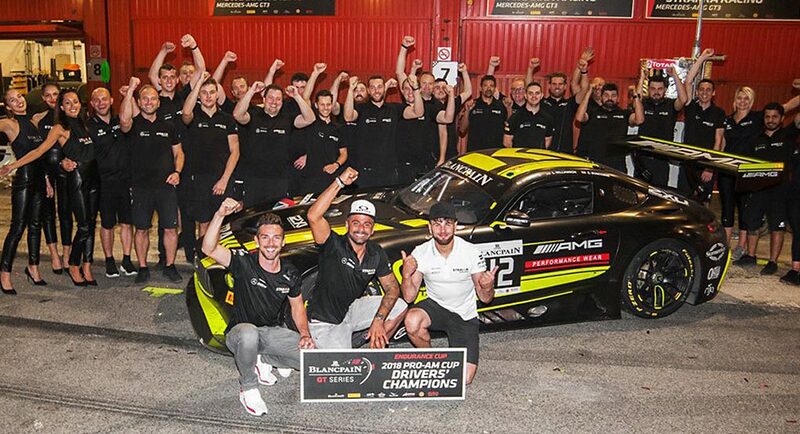 Strakka Racing wrapped up its first Blancpain GT Series Endurance Cup as a Mercedes-AMG Customer Racing team with Nick Leventis, Lewis Williamson and Chris Buncombe taking overall championship victory in the Pro-Am fight. The final race of the season took place today, the Barcelona 3 Hours, with Strakka fielding its three Mercedes-AMG GT3’s as part of a 52-car strong grid. After a strong first season partnered with the German marque, Strakka Racing notched up three podiums between the #42 and #43 entries. Highlights came at the prestigious Spa 24 Hours when the #42 took second place in the Pro-Am championship, another second place at its home race at Silverstone and second place honours at the Monza 3 Hours with the #43 car. The Pro-Am team’s runner-up accolade was the culmination of a season during which they improved their results steadily and were consistently in the top four in class in four of the five races. They opened with a fourth place at Paul Ricard, finished in the same position at Monza, then scored back-to-back podiums in Silverstone and Spa with a brace of second places. Despite a challenging day in Barcelona, previous results plus Pole and a points-scoring finish today sealed the title for Leventis, Buncombe and Williamson. Race day started perfectly for the #42 Pro-Am trio after they secured the Pro-Am Pole Position in qualifying, which also secured them a bonus championship point for pole. Unfortunately, the opportunity of clinching the Pro-Am Teams title was dashed when the team encountered a number of problems. In the second stint, Leventis was hit on track which forced him into the pits for repairs and then Williamson was hit with a drive through penalty for a Full Course Yellow infringement in the final stint. A valiant fight saw the team come through after 92 laps to finish eighth in class, securing four points and sealing the Blancpain GT Series Endurance Cup Pro-Am Drivers title. The #44 showed its best outright qualifying pace of the season today. Felipe Fraga put the GT3 on provisional pole after Q1, with the squad eventually settling for a second row start from fourth once all three qualifying sessions were complete – the #44’s best grid positioning of the season. Fraga, who drove the first stint, fell to seventh after he was hit on the opening lap but the team fought hard over the three hours to compete in the top ten for a points scoring position. Rowland, driving in the final stint, brought the car home seventh, collecting six championship points. The #43 crew equalled their best qualifying result of the year when they started today’s race from 5th position, the same place they secured in Monza earlier in the season. The squad ran as high as fourth during the three hour race and were maintaining position well until Parente had nowhere to go in the second stint, clipping a spinning McLaren and losing several positions. The problems then continued, with Götz handed a 60s stop and go penalty in the final stint and finally crossing the line in 17th.